Last week, in writing on Greek Catholicism, I made passing mention of the “exceptionalism” of the Ukrainian Greek Catholic Church (UGCC) (my ecclesiastical homeland). Misunderstood by a couple of individuals as an expression of chauvinism blind to the trials and hardships of the UGCC, I nearly felt compelled to defend myself before realizing that to certain Catholic ears, any thoughts that fail to heap praise on Latin, Scholasticism, and “the Mass of all time” will always be subject to needless, even thoughtless, scrutiny. To recognize the exceptional status of the UGCC is not to exalt the Byzantine Rite over the Roman, to denigrate the subtle complexity (or complex subtlety) of Scholastic theology, or to privilege the icon over the statue. Rather, recognizing Ukrainian Catholicism’s peculiar vibrancy—and announcing that recognition—is to recognize that despite the great trial the Universal Church finds herself suffering, there is reason for hope. The UGCC spent a majority of the past century undergoing a living martyrdom at the hands of various ideological factions, including atheistic communism. 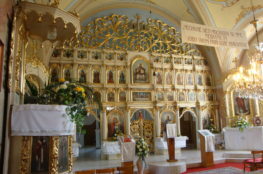 Unlawfully suppressed in 1946 by the Russian Orthodox Church acting in concert with Soviet authorities, Greek Catholicism nearly died out in Ukraine, the spark of its flame being kept alive underground and in the diaspora. The liberation of its leader, Patriarch Iosif Slipyj, in the 1960s ensured the Ukrainian Church’s continuation, though it would take decades before the Vatican finally supported its sister church despite continuing calls by ecumenists to appease the Russian Orthodox. Now, during the reign of Pope Francis, fears have resurfaced that the UGCC will again take a backseat to a new form of ecumenical outreach toward Russia—fears that, for the time being, have been overshadowed by ongoing Vatican capitulation to communist China. And yet still, the UGCC, under the rule of Patriarch Sviatoslav, presses ahead in a Ukraine beset by its own crisis and a larger Catholic world where Greco-Catholics have long endured a ghetto existence. In the Anglophone world, the UGCC recently released Christ Our Pascha, a comprehensive catechism that expresses the unchanging truths of the Church in a Byzantine-Slavic vernacular. Slowly but surely, new studies are emerging on the history of the UGCC and its unique patrimony which assist both in helping Greco-Catholics reclaim their heritage and Latin Catholics in appreciating the particularity within universality that is part of the genius of Catholicism. What makes the UGCC exceptional, particularly at this moment, is that instead of looking to accommodate Church doctrine to the world, she seeks to reshape the world in line with doctrine. Recently, Patriarch Sviatoslav took to Ukrainain TV to promote the Church’s social teaching, including the teachings of Pope Leo XIII in Rerum Novarum. Knowing that Ukrainian society is in need of moral leadership, the UGCC is there to remind the citizenry that what they need above all else is God. Neither Western liberal nor secular nationalism will bring peace and prosperity to Ukraine, and the Church must never become the handmaid of the state—a lesson the Russian Orthodox Church, lacking as they do an authentic integralist tradition, has never internalized. Adding to this exceptionalism is the Ukrainian Church’s internal push to restore its patrimony without sacrificing in full the mutual enrichment it has received from its Western orientation. Granted, this process has not always been as neat and clean as some have hoped. It is important to recall that the project of “de-Latinization” and restoration began under the watchful eye of Metropolitan Andrei Sheptytsky and even he knew that a “big bang” solution was neither feasible nor desirable. While the Latin Church has flirted with the ideas of restoring its own sense of the sacred through the re-introduction of the traditional Latin Mass and the abandonment of liturgical innovations, it has not, as of yet, been able to pull off this feat. If anything, traditional Latin Catholics are finding themselves forced to return to the bunkers in the hopes of weathering the current ecclesiastical storm introduced during the last five years. None of this is to say that the UGCC doesn’t face genuine problems. The Ukrainian diaspora, particularly in the United States, is ageing and missing one, if not two, generations of adherents, lost to conversion, intermarriage, or apostasy. Moreover, Greco-Catholic orthodoxy has not always been able to withstand the machinations of neo-modernism and certainly the ethno-nationalist problem has yet to be resolved in full. Yet there is much in the UGCC that all Catholics, regardless of their particular church affiliations, can admire, if not emulate. 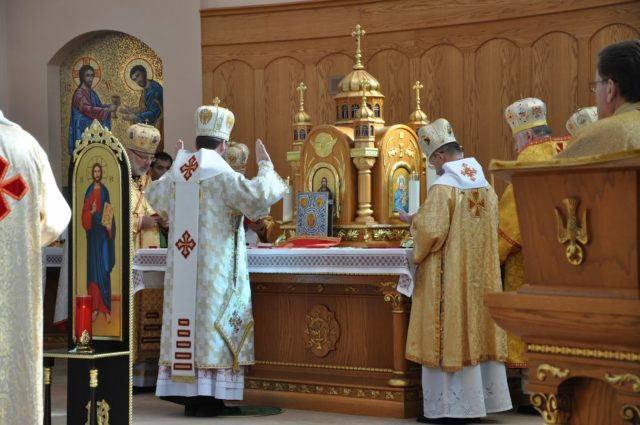 Catholics of all stripes, who truly believe that the Church must breathe with both lungs, should pray for the growth of Greco-Catholicism, not just in Ukraine, but around the world. In turn, Greek Catholic Christians, fierce in upholding the universality of the Church, should petition Our Lord and His Blessed Mother for an end to the present crisis and the restoration of all things in Christ.